Earlier this year we expanded our Early Access Program with brands for RCS business messaging (the mobile industry's term for rich business-to-consumer messages) and a number of brands in the U.S. and Mexico began sending interactive messages to their customers using RCS and getting positive results. 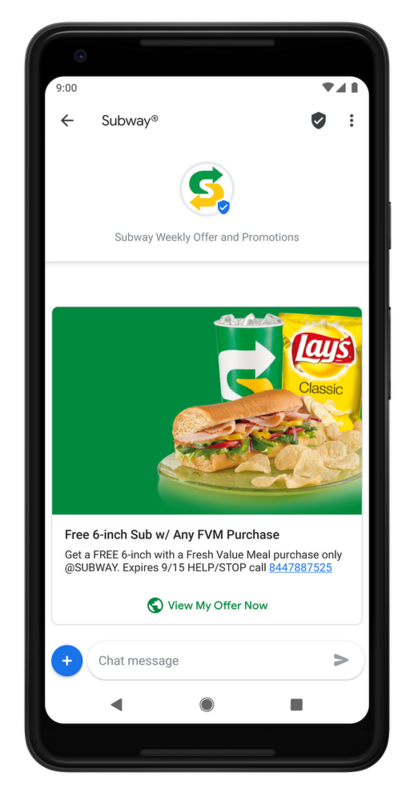 For example, Subway—along with messaging partner Mobivity—sent promotions with detailed images and as a result, saw 144 percent increase in redemption rate compared to the same promotion using SMS. In addition to Subway and the brands we shared earlier this year, Cinemex, Chicago Transit Bot, Elements Massage, Farm Journal Mobile, Overstock, Paris St. Germain, Redbox, SeatGeek, the Sacramento Kings, UnoTV, and Zerorez are engaging with their customers using RCS. These messaging experiences are built as part of Google’s Early Access Program with messaging partners 3CInteractive, Bowtie, Concepto Movil, myElefant, nativeMSG, Podium, Quiq, Telcel, Vibes, and Zipwhip. Brands are using RCS in a number of different ways, from status updates to feedback to customer service, all within the native messaging experience on Android. For example, with the ChiTransitBot, people riding Chicago’s transit system can get directions and find out when the next train is coming. With Redbox, people can browse available movies and games, reserve their favorites, and find a box in just a few taps. And with Overstock, people can get purchase, shipping, and delivery confirmation as well as the option to rate a purchase after delivery or connect directly with customer service. This week at Mobile World Congress Americas, 20 of these brands will demonstrate how they are connecting with their customers using RCS. We’re excited to see Messages and RCS connect more people and businesses, and look forward to expanding our collaboration with the industry to bring better messaging to every Android user.